BACKGROUND AND PURPOSE: A certain number of anatomic variants involving the distal vertebral artery (VA) are explained by variations in size and connection of the lateral spinal artery (LSA). This study examined the possible role of another branch of the VA, the posterior spinal artery (PSA), in the development of similar vascular variations. 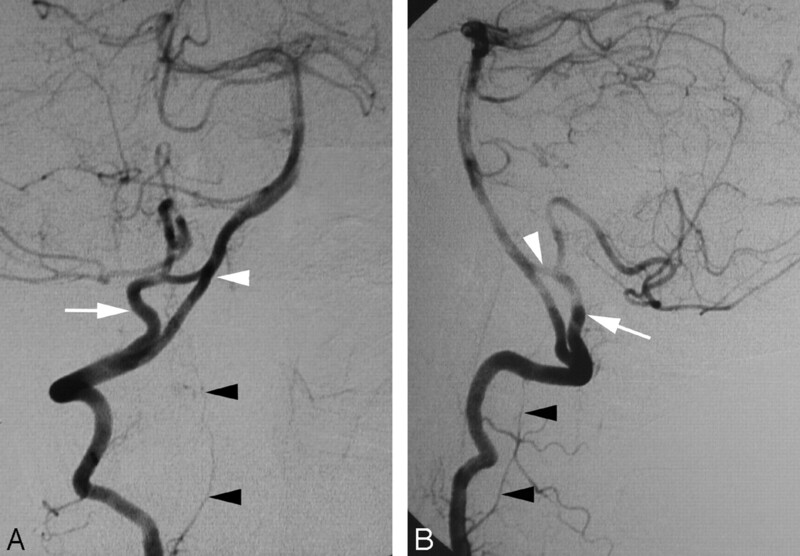 MATERIALS AND METHODS: Four types of variations in the distal VA, including the C1 and C2 origins of the posterior inferior cerebellar artery (PICA), the duplication of the distal VA, and the aberrant course of the distal VA, are illustrated by 9 angiographic observations. RESULTS: For each type of VA variant listed above, examples resulting from variations in size and connection of the LSA and PSA could be matched. CONCLUSION: Variation in size and connection of the PSA is at the origin of a set of anatomic variations of the distal VA similar, but not identical, to the vascular variants linked to the LSA. The formation of the distal vertebral artery (VA) and its principal branch, the posterior inferior cerebellar artery (PICA), involves the combination of several embryonic vascular segments. This complex developmental anatomy was well described by Congdon1 and Padget2,3 in human specimens and by Moffat4 in the rat. Among the embryonic precursors involved, particular attention needs to be given to the spinal branch of the proatlantal artery (ProA) (which corresponds, in fact, to the radicular artery of the first cervical nerve5), the primitive lateral basilovertebral anastomosis of Padget (PLBA), and the lateral longitudinal artery of Moffat. The latter 2 vessels, the PLBA and the lateral longitudinal artery, correspond, respectively, to the intracranial and extracranial portions of the same embryonic vascular channel. In the adult, the extracranial portion of this channel becomes the lateral spinal artery (LSA), a third longitudinal spinal arterial axis completing the anterior and posterior spinal axes at the upper cervical level. Although the LSA was already identified by Kadyi in 1889,5 its role in the developmental anatomy of the distal VA was only recognized later by Lasjaunias and colleagues.6 These authors showed, in particular, that anatomic variants such as the C1 and C2 origins of the PICA, the duplication of the VA, or the intradural course of the distal VA, are related to variations in size and connection of the LSA. We present a series of anatomic variants of the distal VA and PICA origins similar, but not identical, to the variants linked to the LSA system. We propose that these variants are the result of variations in the development of the posterior spinal artery (PSA) rather than the LSA. To illustrate the analogy between the 2 types of variants, and highlight some of their distinguishing features, each illustrated variant linked to the PSA system is matched with an equivalent variant derived from the LSA system. The case histories are arranged according to the type of anatomic variation described with, for each type, examples involving the PSA and LSA systems. A Wada test was performed in a 20-year-old woman as part of the presurgical work-up of a left frontal lobe neoplasm. 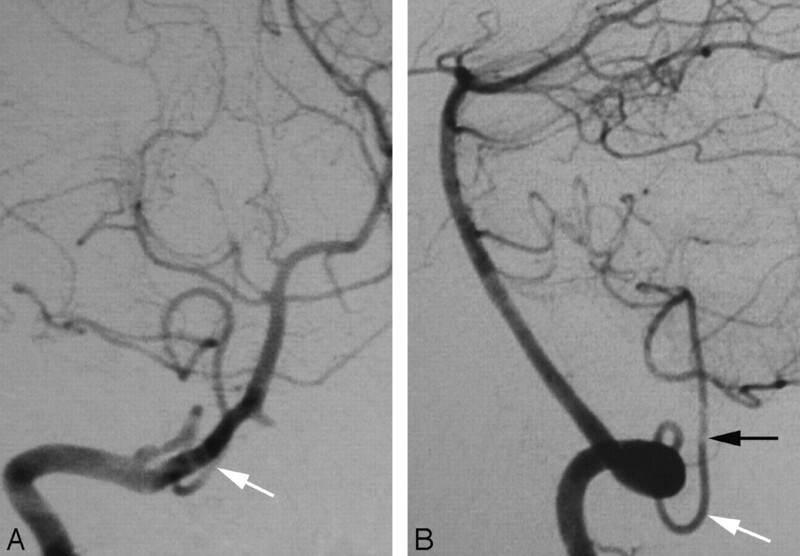 Incidentally, cerebral digital subtraction angiography (DSA) documented a C1 origin of the right PICA. This variant is linked to the PSA (Fig 1A,-B). A proximal origin (C1) of the right PICA (PSA type) in a 20-year-old woman. A, DSA, right VA, anteroposterior view, showing a proximal origin of the right PICA from the superior aspect of the right VA. The PICA trunk has a Z-shaped course consistent with the normal course of a PSA. From a developmental perspective, the segment of the VA proximal to the takeoff of the PICA corresponds to the spinal branch of the ProA, which divides into an anterior radicular branch (the distal VA), and a posterior radicular branch (the PSA). In this case, the ascending ramus of the PSA (white arrow), which normally only establishes a small anastomosis with the PICA, is prominent and constitutes the actual origin of this vessel. B, DSA, right VA, lateral view, showing the dorsal position of the proximal PICA in the foramen magnum region (black arrow), aligned with the ascending ramus of the PSA (white arrow). A 15-year-old boy underwent preoperative embolization of a nasopharyngeal angiofibroma. Incidentally, a proximal origin of the right PICA from both C1 and C2 roots was documented. This variant is linked to the LSA (Fig 2A,-B). A double proximal origin of the right PICA (LSA type) in a 15-year-old boy. A, DSA, right VA, anteroposterior view, showing a double origin of the right PICA from the right LSA via C1 (white arrowhead) and C2 (black arrowhead) roots. Note the location of the PICA origin from the inferior aspect of the VA, consistent with a variation of the LSA. B, DSA, right VA, lateral view, showing the ascending course of the proximal PICA (white arrow) aligned with the LSA (black arrow). The proximal PICA has a more anterior position in the region of the foramen magnum (compare with Fig 1B), consistent with the course of the LSA. A 47-year-old woman presented with acute left lower quadranopsia and left-sided paresthesia after head trauma. MR imaging of the brain revealed right cerebral peduncle and right occipital lobe strokes. Cerebral DSA showed a dissection of the proximal right posterior cerebral artery. Incidentally, a C1 origin of the left PICA was observed. This variant is linked to the PSA (Fig 3A,-B). 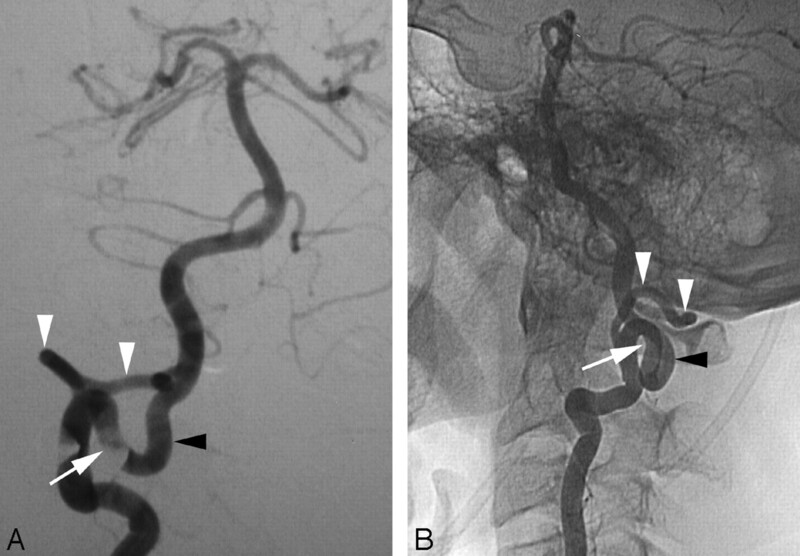 A proximal (C1) origin of the left PICA (PSA type) in a 47-year-old woman, as demonstrated by a 3D reconstruction of a rotational angiogram with simultaneous osseous and vascular rendering. This technique is known as 3D fusion DSA (3D-FDSA) (Infinix NB, Toshiba, Japan). A, 3D-FDSA, left VA, lateral view, showing that the proximal portion of the PICA follows the typical course of a PSA trunk as described by Maillot and Koritke7 (ie, a first segment closely paralleling the distal VA, followed by a sharp caudal and dorsal curve that brings the vessel in a posterior-lateral position within the foramen magnum). The ascending ramus of the PSA (white arrow) then continues as the proximal portion of the PICA. B, 3D-FDSA, left VA, superior axial view, demonstrating the posterior location of the PICA within the foramen magnum. The topographic correspondence between the adult distal VA and PSA/PICA, and the embryonic ventral and dorsal radicular branches of C1 is well illustrated. Cerebral DSA was obtained in a 44-year-old woman as part of an investigation for transient ischemic attacks. The results of the angiogram were unremarkable. Incidentally, a C2 origin of the right PICA was documented. This variant is linked to the PSA (Fig 4A,-B). A proximal (C2) origin of the right PICA (PSA type) in a 44-year-old woman. A, DSA, right VA, anteroposterior view, showing the C2 origin of the right PICA (black arrowhead, partially masked by teeth subtraction artifacts). B, DSA, right VA, lateral view, showing the posterior position of the PICA at the foramen magnum (black arrowhead). The PICA is the cranial continuation of the posterior spinal axis (black arrow), fed by a segmental C2 branch. Note the more anterior position of the LSA (white arrow). A proximal (C2) origin of the left PICA (LSA type) in a 44-year-old woman (figure shown flipped horizontally for comparison with Fig 4). A, DSA, left VA, anteroposterior view, showing a proximal (C2) origin of the left PICA (black arrowhead). B, DSA, left VA, lateral view, showing that the left PICA (white arrowhead) is the cranial continuation of the LSA (white arrow), with which it is aligned. Compared with Fig 4B, the PICA crosses the foramen magnum in a more anterior position consistent with the LSA rather than the PSA. A 47-year-old woman presented with acute left dysmetria. Brain MR imaging showed an acute stroke in the left cerebellar hemisphere. Results of cerebral DSA were normal. Incidentally, a duplication of the distal right VA was observed. This variant is linked to the PSA (Fig 6A,-B). 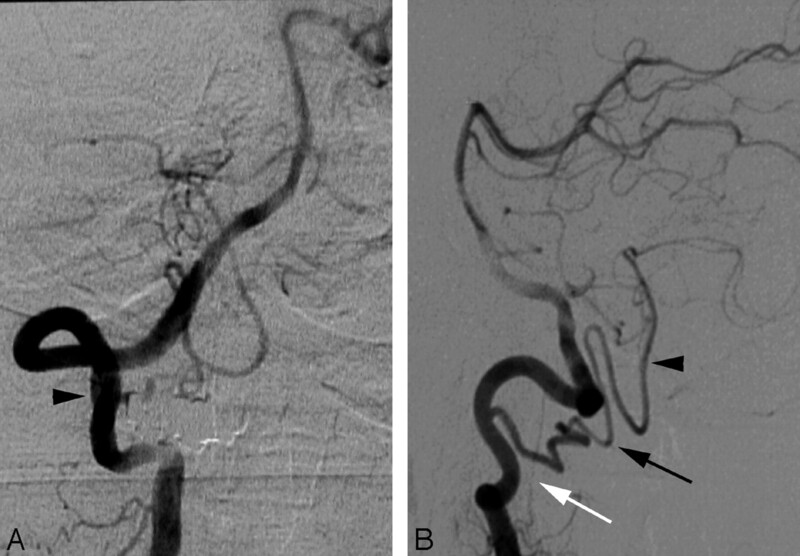 Duplication of the distal right VA (PSA type) in a 47-year-old woman. A, DSA, right VA, anteroposterior view, showing a duplication of the distal VA consisting, in fact, of a double origin of the right PICA from the PSA (C1 origin, white arrow) and from the V4 segment of the VA (normal origin, white arrowhead). The LSA is indicated by black arrowheads. B, DSA, right VA, lateral view, also showing a duplication of the distal VA consisting of a double origin of the right PICA from the PSA (C1 origin, white arrow) and from the V4 segment of the VA (normal origin, white arrowhead). A 52-year-old woman was investigated for left pulsatile tinnitus. The results of the angiogram were unremarkable. Incidentally, a duplication of the distal left VA was noted. This variant is linked to the LSA (Fig 7A,-B). 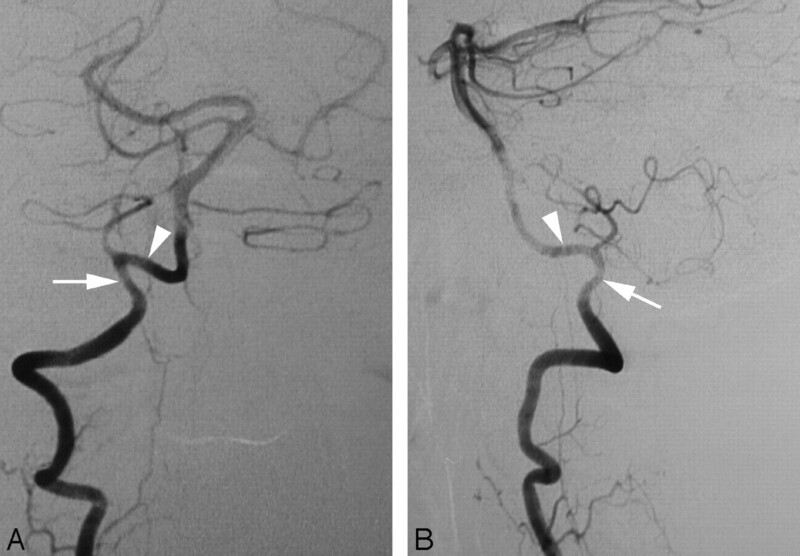 Duplication of the distal left VA (LSA type) in a 52-year-old woman. A, DSA, left VA, anteroposterior view (flipped horizontally for comparison with Fig 6A), showing a dominant intradural segment (black arrowhead) corresponding to the LSA with a prominent C2 root (white arrow). The normal distal VA is slightly hypoplastic (white arrowheads). B, DSA, right VA, unsubtracted lateral view. As with Fig 7A, this variant also shows a dominant intradural segment (black arrowhead) corresponding to the LSA with a prominent C2 root (white arrow). Brain MR imaging in a 64-year-old woman with systemic lupus erythematosus and progressive cognitive changes showed scattered foci of white matter T2-weighted hyperintensity, suggesting cerebral vasculitis. Results of cerebral DSA were normal. Incidentally, a superior convexity of the distal right VA was observed. This variant is linked to the PSA (Fig 8A,-B). 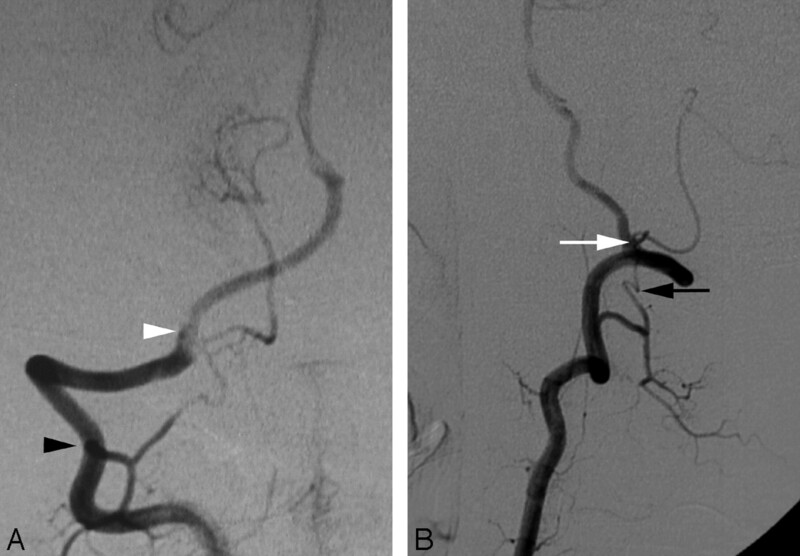 An aberrant course of the distal right VA (PSA type) in a 64-year-old woman. A, DSA, right VA, anteroposterior view. This variant is similar to the VA duplication shown in Fig 7, with a double origin of the PICA from the PSA (white arrow) and from the distal VA (white arrowhead). The difference between the 2 variants lies in the absence of a segment of the right VA between the 2 PICA origins, resulting in a seemingly “aberrant” course of the VA.
B, DSA, right VA, lateral view. As with Fig 8A, this variant is also similar to the VA duplication shown in Fig 7, with a double origin of the PICA from the PSA (white arrow) and from the distal VA (white arrowhead). A 58-year-old woman presented with syncopal episodes suggesting vertebrobasilar insufficiency. Results of cerebral DSA were unremarkable. An intradural course of the right VA was noted (Fig 9). 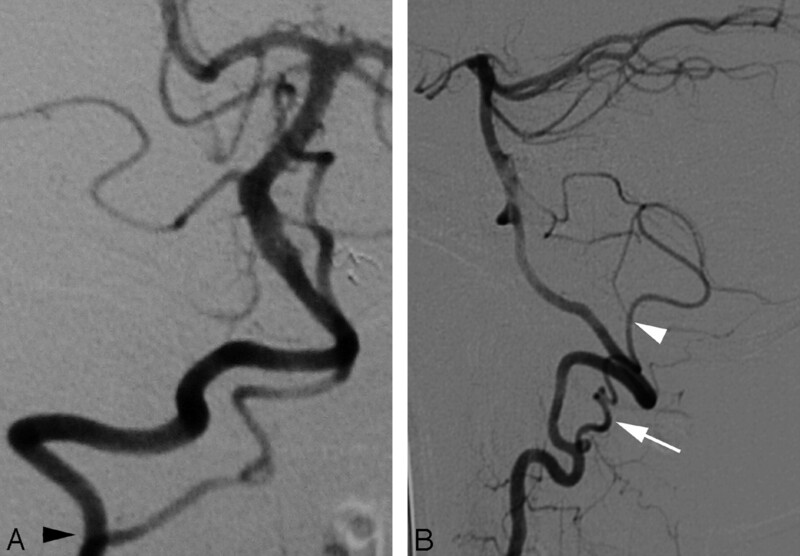 A 58-year-old woman with an aberrant course of the distal right VA (LSA type). DSA, right VA, anteroposterior view, showing the intradural course of the distal VA that is, in fact, a prominent segment of the LSA (white arrow). Note the presence of a very small vascular channel corresponding to the real distal VA (white arrowhead). After a brief review of the normal and developmental anatomy of the cervical spinal arteries, several anatomic variants involving the distal VA and the PICA will be considered, and the embryologic mechanisms underlying their formation discussed. For each variation, 1 or more cases involving the PSA system will be matched with and compared with an example involving the LSA system. The blood supply of the spinal cord is derived from 3 longitudinal vascular axes: the anterior spinal artery (ASA) and the 2 unpaired PSAs.5 The ASA is formed by the junction of 2 small anterior spinal rami originating from the intracranial portion of each VA. These rami unite ventromedially to form a single descending channel that runs along the ventral sulcus of the spinal cord. In practice, there is often, if not always, an asymmetry in caliber of these 2 rami, and it is not unusual to see the ASA be the continuation of a single VA root. The PSAs usually originate from the extracranial portion of the VA, generally near its point of dural penetration, or from the PICA itself7 (Fig 10A). From their origins, the unpaired PSA course caudally along the posterolateral surface of the spinal cord, where they form 2 parallel anastomotic chains located dorsal to the attachment of the posterior nerve roots. Schematic representation of the normal anatomy of the PSA and LSA systems, as well as some of their variations (right side). A, The extradural and intradural segments of the vertebral artery (VA) are shown in dark and light gray, respectively. The PSA originates from the extradural VA and parallels its course before bifurcating into a descending posterolateral ramus (the PSA per se), and an ascending ramus joining the PICA. The latter may become a variant origin of the PICA. The anterior spinal artery (ASA) is also shown. B, The C1 origin of the PICA (PSA type). The anastomosis between the ascending ramus of the PSA and the PICA is prominent, and the PSA serves as the actual origin of the PICA. 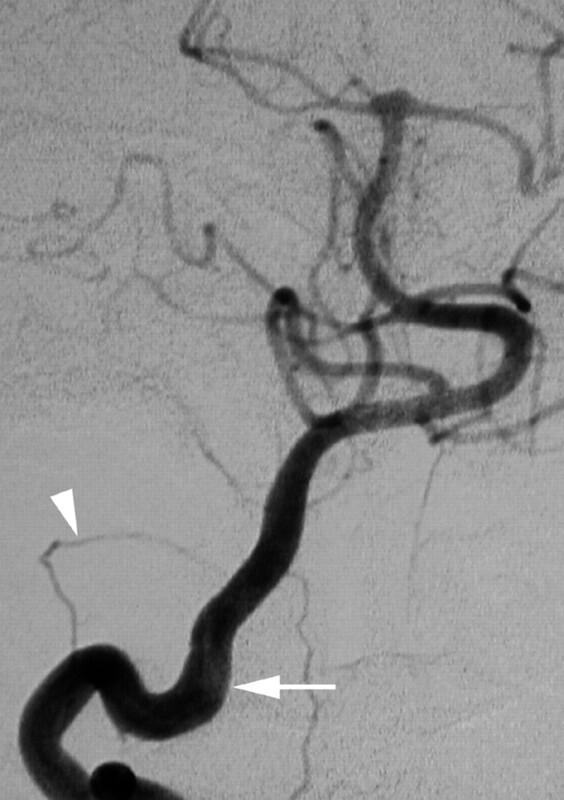 C, A distal VA duplication of the PSA type, in which the true distal VA is paralleled by a supernumerary vascular segment that branches off the PICA. The relative size of the 2 limbs can vary. If the true distal VA is markedly diminutive or absent, the variant becomes an aberrant course of the VA (PSA type). D, The LSA is the most lateral of the 3 cervical spinal axes. It establishes several segmental connections with the VA (C1-C4) as well as a cranial anastomosis with the PICA. E, The C1, C2, and C3 origins of the PICA (LSA type). The rostral anastomosis of the LSA with the PICA is prominent, and any of the lateral segmental connections of the LSA with the VA may serve as a PICA origin, alone or in combination. F, A duplication of the distal VA of the LSA type. This time, the true VA is cranial to the supernumerary limb, which is made of a prominent LSA segment. 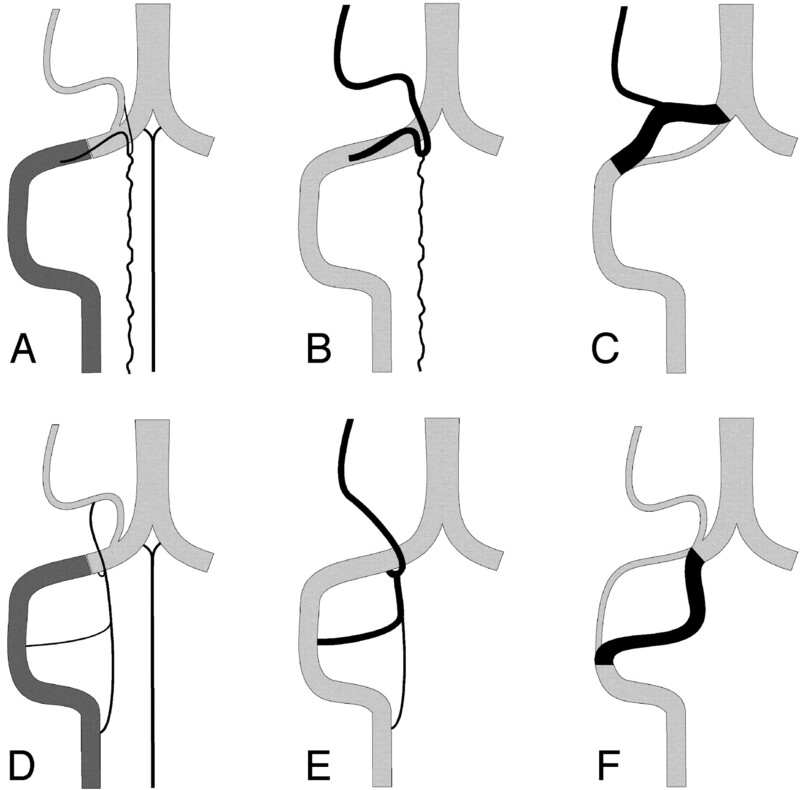 If the true distal VA is markedly diminutive or absent, the variant becomes an aberrant course of the VA (LSA type). The PICA originates most frequently from the intracranial portion of the VA, approximately 15 mm proximal to the vertebrobasilar junction, along the lateral aspect of the medulla. From its origin, the PICA courses laterally, along the roots of the hypoglossal nerve, forms a caudal loop over the dorsolateral aspect of the medulla, and turns upward to pass between the tonsil and the vermis, at which point it divides into its medial (vermian) and lateral (hemispheric) branches. The PICA is a late phylogenetic acquisition that appears fully developed only in humans.8 Common variants involving the PICA include low origins at C1, C2, or C3, usually explained by variations in size and configuration of the LSA,6 as well as the origin of the PSA from the PICA. The ProA is an embryonic vessel located between the most caudal presegmental artery (ie, the hypoglossal artery) and the first cervical intersegmental artery, which accompanies the second cervical nerve root (C2).3 Therefore, the ProA courses between the occipital bone and the atlas, along with the first cervical nerve root (C1). The ProA is one of the transient anastomoses that supply the basilar circulation before the development of the VAs. The ProA branching pattern follows the typical distribution of an embryonic segmental artery. In particular, it branches off a spinal artery (the radicular artery of C1) that divides into ventral and dorsal radicular branches. The ventral branch follows the anterior radix of C1 until it reaches the anterior-lateral aspect of the spinal cord, where it divides into ascending and descending rami. These rami later fuse with their contralateral counterparts to form the basilar and ASAs, respectively. Unlike the spinal branches at other cervical levels, the spinal branch of the ProA and its ventral radicular component remain prominent in the adult; in fact, they eventually form the distal segment of the definitive VA. The dorsal radicular branch has a similar fate: it courses along the posterior radix of C1 until it reaches the posterolateral aspect of the spinal cord, where it divides into ascending and descending rami. The descending ramus anastomoses with the posterior spinal plexus of Moffat (the future PSA)4 and later becomes the trunk of origin of the PSA. The left and right PSAs do not fuse but remain separate vessels on each posterior-lateral aspect of the spinal cord. The ascending ramus of the dorsal radicular branch is smaller and establishes a connection with the PICA. C1 Origin of the PICA. A low PICA origin at the C1 level is a frequent variant, whose relationship with the LSA was identified by Lasjaunias and coauthors.6 Rostrally, the LSA and the PICA are connected by small anastomoses located at the level of the restiform body. It is believed that, during embryonic development, one of these anastomoses remains prominent and establishes a longitudinal continuity between the PICA and the LSA, the PICA eventually originating from the extradural VA through the LSA. Case 2, which shows a double origin of the PICA from the VA at the C1 and C2 levels, illustrates this concept (Fig 2). In this configuration, the proximal segment of the PICA corresponds to the LSA (Fig 10E). On the other hand, in case 1, the PICA originates from the superior aspect of the distal VA, and adopts a “hairpin” course with a cranial loop before it passes posteriorly and ascends toward the cerebellum (Fig 1). This typical hairpin course of the initial portion of the PICA strongly resembles the course of the radicular arteries joining the posterior longitudinal spinal axis. As mentioned above, the PSA corresponds embryologically to the descending ramus of the posterior radicular branch of C1, whereas the ascending ramus establishes small connections with the PICA. Indeed, small anastomoses between the PICA and the PSA have been described in the literature. For instance, Sabatier,9 Maillot and Koritke,7 and Lazorthes and colleagues10 explicitly mentioned an ascending branch of the PSA that anastomoses with the PICA. By analogy with case 2, these anastomoses may be preferentially recruited during development to result in an apparent origin of the PICA from the PSA (Fig 10B). Case 1 thus represents an alternative C1 origin of the PICA from the PSA system. Case 3 shows another example of a low PICA origin at the C1 level from the PSA. Figure 3 particularly illustrates how well the distal segment of the VA corresponds to the anterior radicular branch of C1 and how the proximal segment of the low PICA displays the features of the posterior radicular branch (PSA). C2 Origin of the PICA. Case 4 shows a C2 origin of the PICA of the PSA type and case 5, the corresponding variant derived from the LSA system. The posterior location of the PICA at the level of the foramen magnum, the hairpin turn of its proximal segment, and the presence of a separate LSA help identify the PSA-type variant. On the other hand, the LSA variant has a C1–C2 course aligned with the expected course of the LSA, resulting in a more anterior position at the foramen magnum. Arterial duplication refers to the division of an artery into 2 distinct vessels with different courses. Fenestrations, in which a single arterial lumen divides into 2 parallel channels following the same course, are frequently confounded with duplications. Duplications of the VA derived from the LSA system have been described by Lasjaunias and coauthors.6 In this variation (Fig 10F), the upper limb of the duplication corresponds to the VA per se, whereas the lower limb is a prominent intradural LSA segment (as in case 7). Case 6, which shows a VA dividing into 2 vessels with separate courses, is also consistent with an arterial duplication. However, in this situation, the duplicated segment is more distal, and the supernumerary limb is located above rather that below the limb corresponding to the normal VA component (Fig 10C). The upper limb of the duplication forms an upward loop, from which the PICA arises. In this variant, we believe that the upper limb results from the simultaneous persistence of both the normal origin of the PICA and of a second origin derived from the PSA system (equivalent to a low PICA origin, as shown in case 1). Here again, the identification of a distinct LSA helps to differentiate the 2 types of variations (ie, derived for the LSA or PSA systems). Case 9 is an example of an intradural course of the distal VA. In this variant, the apparent distal VA corresponds, in fact, to a prominent LSA, whereas the VA may be diminutive (as in this case) or absent. It is similar to the VA duplication illustrated in case 7 and can be viewed as a VA duplication in which the LSA limb is markedly dominant (Fig 10F). Case 8 shows a more distal type of “aberrant” course of the distal VA, where the vessel forms an upward loop that gives rise to the PICA. We propose that this aberrant course results from the simultaneous presence of 2 separate origins for the PICA, the normal one as well as a second origin derived from the PSA system. This situation is, in fact, similar to the distal VA duplication illustrated in case 6, the difference being that the normal distal VA is diminutive or absent in this aberrant course (Fig 10C). Thus, it appears that a parallel can be drawn between a duplication and an aberrant course of the distal VA for variants derived from either the LSA and PSA systems. An aberrant course is an extreme form of duplication in which the limb corresponding to the normal VA is diminutive or absent, whereas the “supernumerary” limb has become a markedly dominant or unique vessel. Anatomic variations commonly involve the distal segment of the VA. Lasjaunias and colleagues6 have simplified this complex anatomy by showing that a certain number of anatomic variants can be understood as segmental caliber variations of the distal VA and of one of its branches, the LSA. This report shows that a similar but not identical set of anatomic variants of the distal VA is linked to another of its branches, the PSA, as the result of comparable segmental alterations in caliber and connections. Accepted after revision October 15, 2006.